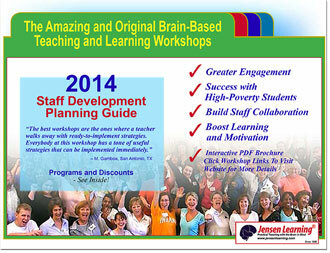 You may qualify for graduate level university credits by attending any of the Jensen Learning Events. Credits will require time, work and money, but in some cases, they may be well worth it. At the event itself, ask Diane for the application for credits. Our goal is customer satisfaction. Having said that, there are things we can and things we cannot do. If bad things happen and you cannot make a workshop, we want to be fair to you. Give us notice and we can refund your tuition. On the other hand, if an emergency happens on the day of a workshop, we cannot replace you with another registrant on the “wait list” so we’ll have to transfer your tuition to future program. See details below. Your tuition may be refunded if you give us enough notice. Cancellations must be made in writing by fax (808-552-0220) or e-mail (info@jlcbrain.com) at least 14 days prior to the start date of the event you’ve registered for. This allows us to let in any other persons on a “wait list.” Your refund (less $50 administrative fee) will be issued. If cancellation is made within 14 days prior and up to the 1st day of the event your registration is transferable to another event within the same or next calendar year. Register for the #1 attended brain-based course in the world—discover the brain’s best-kept learning secrets in 4 days and get enough research-based, classroom-tested, practical strategies for years! You’ll learn the principles and strategies for positive changes that can skyrocket achievement scores. This amazing 2-Day event gives you the extreme skills and insider knowledge, with practical classroom-tested tools to reach every student, nearly every time. You will learn how to successfully understand and intervene with reluctant, hyperactive, apathetic or even disconnected learners in a totally new way.